Panaji, March 20: Former Goa Chief Minister late Manohar Parrikar features on the iconic Amul Butter billboard advertisement because he was a colossal leader and won both the hearts and minds of the people, Cabinet Minister Vijai Sardesai told the state legislative assembly on Wednesday. Manohar Parrikar Dies at 63: From IIT Graduate to Defence Minister — Life And Times of The Late Goa CM. "The (Amul Butter) cartoon is an expression of a big event in the country," Sardesai said during a condolence motion which was moved by BJP MLA Rajesh Patnekar on Wednesday to condole the deaths of the former Defence Minister, former deputy Chief Minister Francis D'Souza and former deputy Speaker Vishnu Wagh. Manohar Parrikar Cremated With State Honours as Thousands Pay Final Respects to Late Goa CM With Tears and Prayers. Sardesai said that he had seen the black and white Amul butter ad, with a caption that reads 'Har Goan ka Manohar', on National Highway 17 while he was on the way to the state assembly. 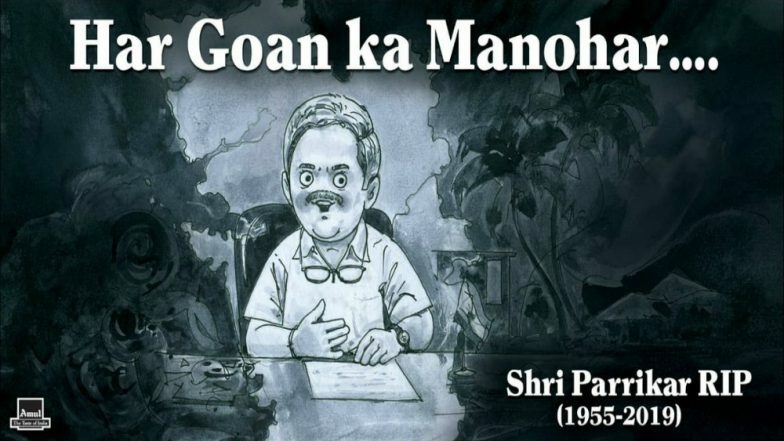 "The Amul cartoon ad says 'Har Goan ka Manohar'. 'Manohar' is one who wins over the mind. This Manohar did not just win over minds, but he won over the heart too," Sardesai said. Parrikar died on Sunday (March 17) after fighting a prolonged battle with pancreatic cancer.